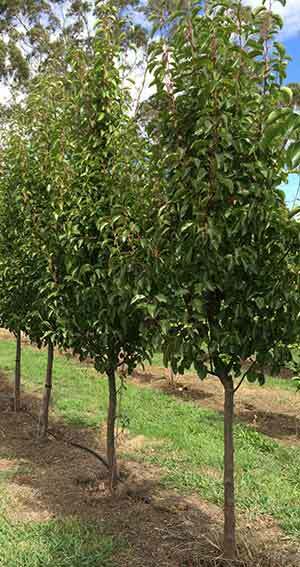 If you are looking for advanced trees with great root systems and a good canopy, then Field Grown Advanced Trees could be the solution. Field Grown Advanced Trees have a number of advantages over many of the trees grown in containers. Root bag technology has been around for a number of years and is a proven way of growing advanced trees at reduced costs. They can have better root systems, more feeder roots and a root system that does not circle. They are cheaper because they are grown in the ground, this is a easier way for nurseries to grow trees. They have better canopies, as trees grown in the ground develop a better and stronger branching system than those grown in containers. Field grown advanced trees are grown in Root Control Bags (RCB). This is a fabric bag that allows around 80% of the root system to remain intact when they are dug from the ground. This allows for easy transport, and easy transplanting. The RCB is cut away just before planting, minimising root disturbance. Although they only available in winter when the trees are not in active growth, Field Grown Trees are quick to establish, cheaper than alternatives and provide a better look when planted. So if you are looking for advanced trees, you will find that Field Grown Trees may provide you with a cheaper and better way of buying trees for the landscape. This will depend on the grower, however it includes a wide range of ornamental, screening and landscaping trees. Field Grown Advanced Trees are available from the following growers.